All aboard the Peanuts Christmas train! Ride with Woodstock, Snoopy, Charlie Brown, Sally, and Lucy. From beloved folk artist Jim Shore. Sally's car no. 2 is only available as part of this set! Beloved folk artist Jim Shore teamed up with another American institution - Peanuts. 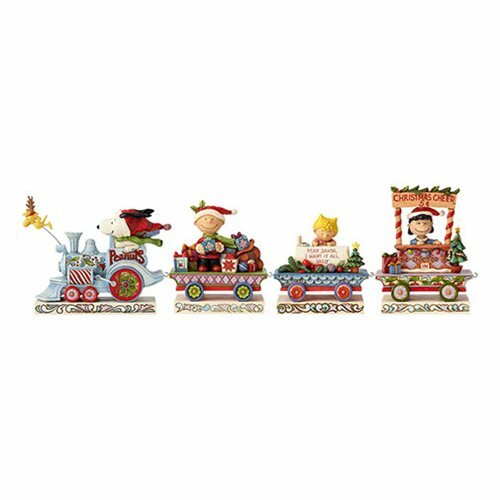 This sensational 16-inch long Peanuts Deluxe Christmas Train Set by Jim Shore boasts an exclusive addition; Sally's car no. 2 is only available as part of this set! Each of the four pieces is meticulously sculpted from high-quality stone resin, handcrafted and hand painted with a vintage-inspired color palette and folk-art motifs. This beautiful Christmas train set will be a joyous holiday favorite for your entire family for many winters to come.